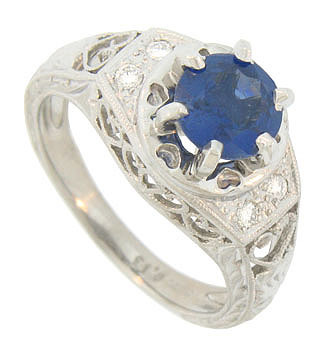 This captivating antique style platinum engagement ring is set with a 1.37 carat round cut sapphire. 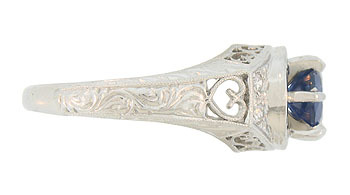 The spectacular mounting is decorated with vines of heart shaped filigree and jewel cut organic engraving. The shoulders of the ring are set with pairs of round cut diamonds outlined in distinctive milgrain design. 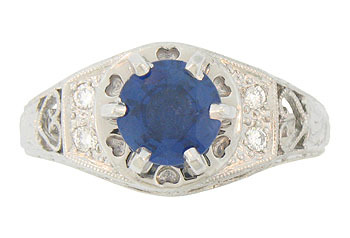 A frame of deeply impressed hearts surrounds the glittering center stone. 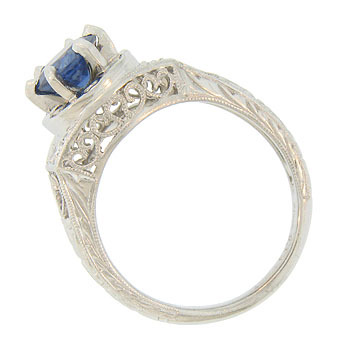 The ring measures 10.25 mm in width. Size 7. We can re-size.